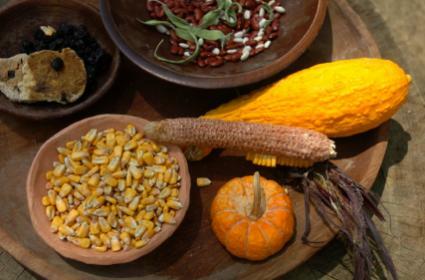 Corn, beans and squash were important staples in the Native American diets. Many people who are interested in green living are turning to Native American gardening techniques to learn how foods were grown in the past. Native Americans had to survive on what they grew, as well as what was available in the wild, for their survival. Some of the techniques that they used in the past are still used successfully today. Native Americans used many of the techniques that we use today in our gardens. For example, corn or maize was grown in rows because it made pollination easier. Beans that couldn't grow without a trellis were trained on poles or cornstalks. Gardens were often fertilized with fish from nearby creeks or rivers and today we use bone or fish meal for the same reason. One of the most often used Native American gardening techniques was the Three Sisters. This method used three different seeds planted together in one large mound of dirt. The seeds were corn, squash and beans. Each of these seeds would provide something that the other seeds would need as they grew. The beans would provide nitrogen to the soil, which the corn and squash would need to grow strong. The corn provided a trellis on which the beans would grow. The squash provided cover for the other two plants as they were growing and helped to deter some pests. Some Native Americans would also put a fish or eel in the hole first, and then place the seeds on top before covering with soil. This provided added fertilizer to the soil. It is interesting to note that the growing of the Three Sisters varies in the east and west. In the west, the bean varieties cultivated were often self-supporting, so they did not have to be planted in the same hole as the corn and squash. Some of the southwest tribes also planted a "fourth sister" in addition to corn, beans and squash. They also planted the Rocky Mountain bee plant, which helped to attract bees to pollinate their gardens. The Jerusalem artichoke, also known as the sunchoke, is a perennial sunflower that has edible tubers. Native Americans ate them mashed like potatoes. It was also used as a thickening agent in soups and stews. They were grown along dried river bottoms and in fertile loam soils so that the tubers were easy to dig up once mature. They were grown, and still are today, in the northern third of the United States. Wild rice was an important part of the American Indian diet. It was grown in Wisconsin, Minnesota and parts of the Great Lakes. Wild rice needs three to eight feet of water to live in. It depends on consistency in the weather and water levels in order to survive. Women would go into the water several weeks before the rice was ready to be harvested. They would tie the rice into small sheaves, which kept the rice kernels from falling into the water when they ripened. Today, as in the past, the rice is collected in canoes. While several people paddle a canoe, one person sits at the stern and uses long wooden poles to knock the rice grains into the canoe and then the plants are allowed to spring back into place. Some grains are always left behind on the plants so that they re-seed for the following year. The Native American diet consisted of 80 percent fruits and vegetables and 20 percent meat. They did not grow everything they needed because much of what they ate was growing wild around them. Depending upon where they lived they had pine nuts, maple syrup, cranberries, blueberries and many other fruits and nuts growing around them to sustain them. What they collected from their gardens in the fall was stored, often in holes dug in the ground, to help them survive the winter months.